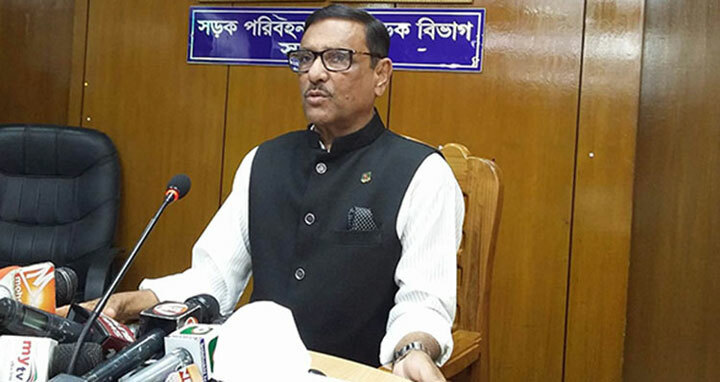 Dhaka, 3 May, Abnews: Awami League General Secretary and Road Transport and Bridges Minister Obaidul Quader on Thursday said there is no scope for BNP to have any a technocrat minister during the polls-time government as the party has no representation in Parliament. "During the last election in 2014, we had proposed them to take part in the poll-time government and even offered the home ministry, which was an open secret, as they had representation in parliament...Now the government has no plan to include BNP in the cabinet of the poll-time government," he told journalists at a press conference at his secretariat office here. Quader said, "This is BNP's decision whether it will take part in the upcoming national elections or not... But the election train would not stop for BNP." "We will congratulate BNP if the party joins the next polls...But it is not our responsibility to bring them in the polls," the AL general secretary said, adding this time the people will resist them if they want to obstruct the election. He said, "It is their right to participate in the election or not... We've nothing to do about it." Referring to a remark of BNP leader Mirza Fakhrul Islam Alamgir about Tarique Rahman over holding BNP’s chairmanship, he said Tarique has been convicted on graft charges and Khaleda Zia is now in jail for graft. ‘So, it proves that the party is a corrupt one,’ he said. He, however, said it is their right to participate in the election.